A Colorado Department of Transportation truck drives down U.S. Highway 40. Paving will continue today in Craig at Colorado Highway 13 and Moffat County Road 7. 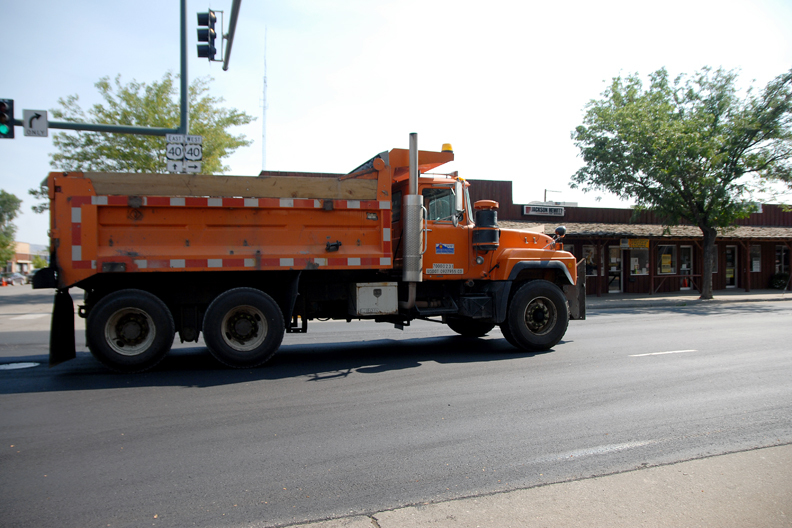 The Colorado Department of Transportation began a paving project Tuesday in Craig, with work continuing today, transportation officials announced in a news release. On Tuesday, CDOT crews paved a section of U.S. Highway 40 and Yampa Avenue. Today, CDOT will be paving another section of Highway 40, at Colorado Highway 13 and Moffat County Road 7. Crews rotomilled and repaved the section of Highway 40 at Yampa Avenue. One lane of the highway was closed, and each direction of traffic was alternated through the work zone by flaggers. From 6 a.m. to 5:30 p.m. today, crews will be rotomilling and paving the section of Highway 13 and County Road 7, which will require crews close one lane of the highway and alternate traffic through one direction at a time. Delays are expected as part of the project and speed limits will be reduced near construction. Motorists are reminded to obey all road signs and flaggers, and to drive Slow for the Cone Zone.